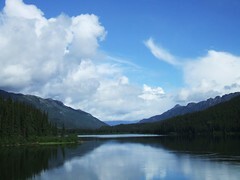 Cassiar Highway and Beyond, way beyond. I can not even remember how long it was since we started our ride south on the Cassiar Highway, since the bugs ate me alive at the Junction of 37 and the Alaskan Highway. Was it a week ago we started, or was it two or three ago. I can not even remember what day today is. It is not that I have a memory problem or any more then usual. It is just days and nights run into each other and all the markers that keep track of the day are left behind when we travel each day to a new place. There is a common thread that keeps it all together. Bugs, bugs and more bugs. There is now reason for this many bugs. I am currently trying to recover from a bite that got me a week ago in the eyelid, swelled it up so bad I look like I just got out of the boxing ring. The rain was something that dampened out spirit and has been a thread of commonality. 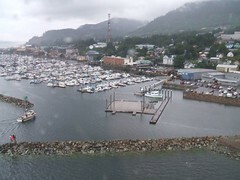 Currently we are in Ketchikan, Alaska hiding out at Alltec Computer store updating our website which is really avoidance from going out and getting wetter then wet. 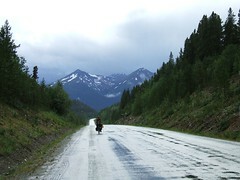 It seems we really are wimps but we are working on getting ready for the West Coast ride down the USA through Oregon. Also another common thread is the amazing wonderful people we meet that share so much with us. Wow! People are really wonderful. Thank you all for your gifts of generosity. View of Ketchikan, Alaska from the float plane which delivers the US mail to Hyder, Alaska. 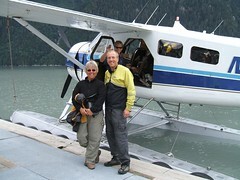 We took this plane from Hyder, Alaska to Ketchikan with our bikes and all our luggage. Amazingly it all fit. 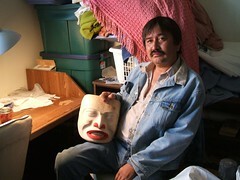 Ed Frank, a Tahltan member, is a carver of great skill which he shared his sketches and carving at his home on Tahltan band reservation near Telegraph Creek along the Stikine River. 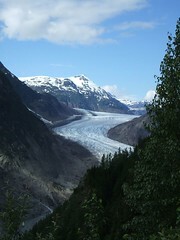 The people here are all so friendly and open to visitors.